[post_ads]Succulent, fresh-from-the-gulf shrimp is usually reserved for a special meal on the weekends. However, in less than thirty minutes, your family can enjoy shrimp, rice, and flavorful vegetables with this quick and easy sheet pan supper recipe. It’s a great way to spice up your weeknight dinner routine from the usual easy chicken or pork chops. Adding the ingredients in stages to the sheet pan ensures that the vegetables cook through and the shrimp stays juicy, while still keeping clean-up minimal! To keep prep time under thirty minutes, we call for microwaveable rice, but feel free to substitute your favorite rice or grain, such as quinoa or couscous, or to use your trusty rice cooker. We love any dinner that makes our day easier from prep to clean-up, so this dish is a winner any day of the week. Preheat broiler with oven rack 6 inches from heat. Stir together olive oil, garlic, crushed red pepper, and 3/4 teaspoon of the thyme in a small bowl. Place shrimp and tomatoes in 2 separate bowls. Combine zucchini and yellow squash in a third bowl. Toss each with one-third of oil mixture. [post_ads]Heat a rimmed baking sheet in the oven, 2 minutes. Add zucchini, squash, and lemon (flesh side up) to hot baking sheet, and bake until squash begins to soften, about 5 minutes. Add tomatoes, and bake until tomatoes begin to burst, about 5 minutes. 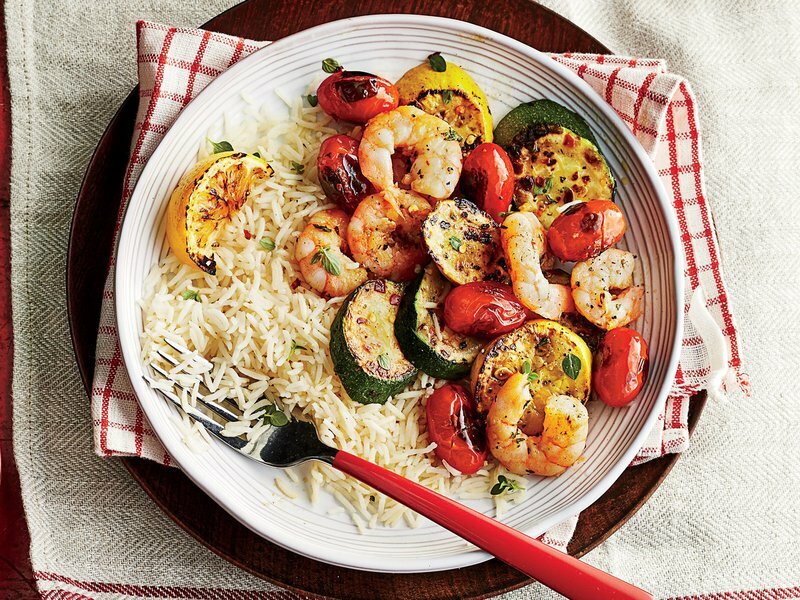 Stir in shrimp; bake until shrimp are cooked through and zucchini is tender and lightly browned, about 5 minutes. Remove from oven, and sprinkle with salt and pepper. Squeeze juice from roasted lemon over vegetables; stir to combine. Cook rice according to package directions. Divide rice, shrimp, and vegetables among 4 plates. Top evenly with remaining 3/4 teaspoon thyme.